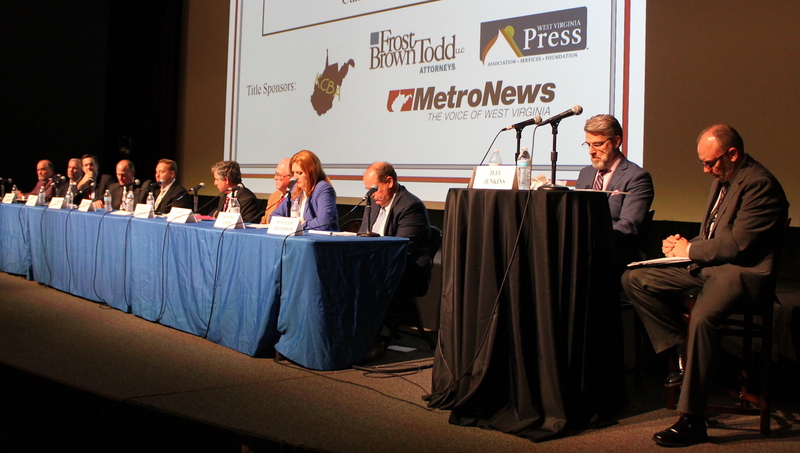 CHARLESTON, W.Va. — Nine candidates for the West Virginia Supreme Court participated in a public forum Thursday night in Charleston, giving voters a chance to review candidates seeking the seat previously held by Justice Robin Davis on the state‘s Supreme Court. Candidates included Jim Douglas, Kanawha County; Robert J. Frank, Greenbrier County; Evan Jenkins, Cabell County; Jeffrey Kessler, Marshall County; Brenden D. Long, Putnam County; William Schwartz, Kanawha County; Marty Sheehan, Ohio County; Dennise Renee Smith, Kanawha County; and William Stewart Thompson, Boone County. The forum — held at the West Virginia Culture Center at the State Capitol Complex — was organized by the West Virginia Bar Association. Gregory W. Bowman, WVU College of Law, and Jeff Jenkins, WV MetroNews, will moderate the forums. WV Press Association photo.